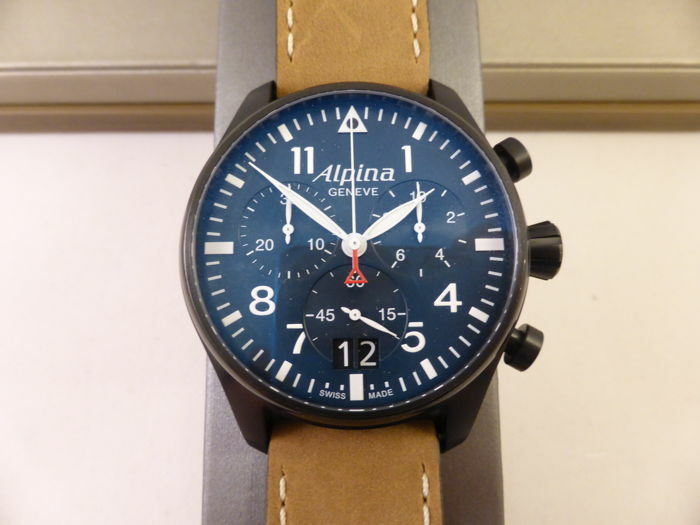 The Swiss Alpina exists since 1883. The high-quality watches are sporty, sturdy and accurate. 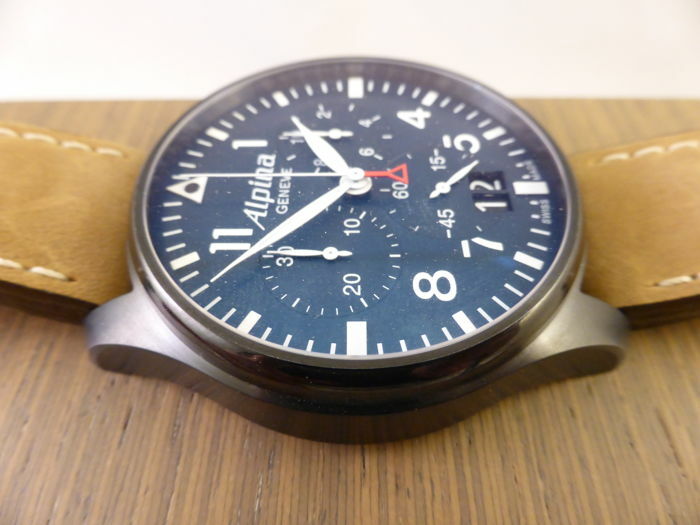 Alpina AL-372N4FBS6 Startimer is a Pilot quartz men's watch. 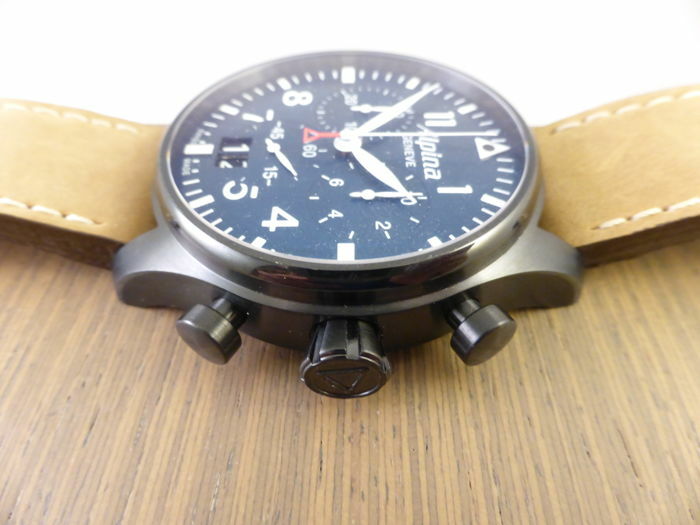 The watch has a date and a chronograph function. 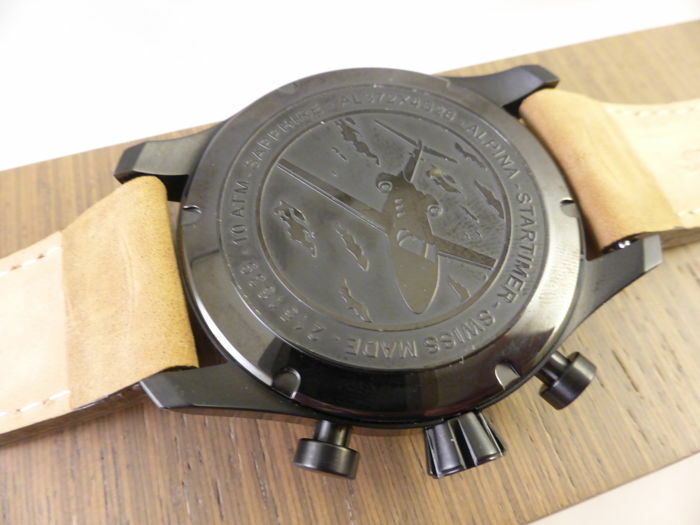 The black stainless steel PVD case has a diameter of 44 mm. The glass is made of sapphire. The dial is blue. 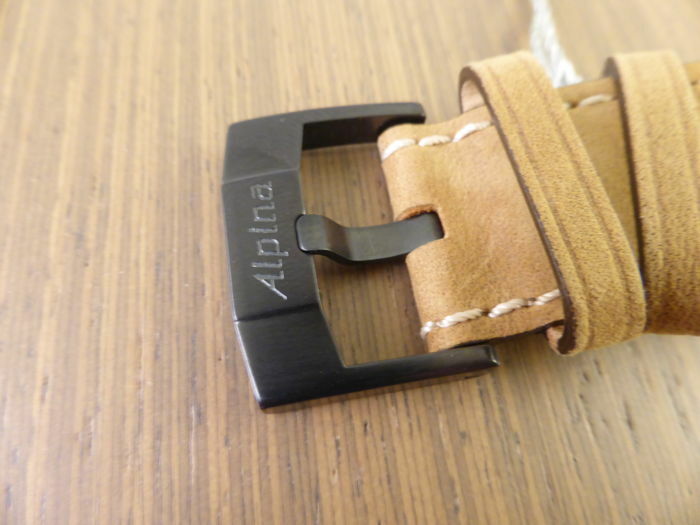 The brown leather strap closes with a steel buckle. The watch is new, never worn, and in perfect condition. 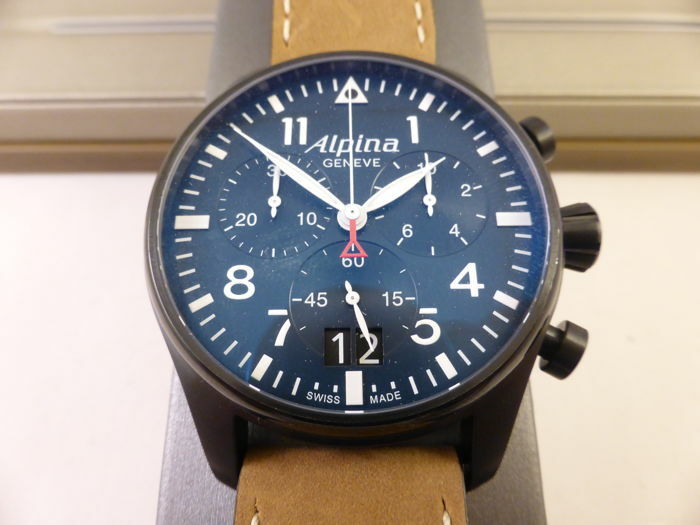 The watch comes with an official Alpina packaging, certificate, instruction booklet and warranty certificate. Montre avec emballages d'origine, documentation comprise. Colis sécurisé et livré dans des délais correct. Alles is in perfecte staat. Nieuw zoals aangegeven en super tevreden met de aankoop. Something went wrong with the shipment, quick response. Beautiful watch! Watch received in good order, although it came in the wrong box and without papers at first very quickly they send me the correct box with a free gift for compensation. Beautiful watch! Zeer positief. Horloge is zoals omschreven en vastgelegd op de foto’s. Goed verpakt en snel bezorgd. 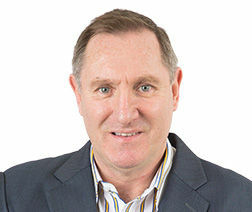 Végig korrekt volt az eljárás. Szervezett és pontos a szállítás. Gran reloj, nuevo y tal y como estaba descrito en la subasta. Rápido envío. Recomendable vendedor. Perfect condition for the watch. The delivery was a bit late, as Post NL could use some service improvement. Take this into consideration. The nice watch, with its full set, corresponds exactly to the photos and the description. Parcel delivered in 15 days. Tout est OK livraison en une grosse semaine... matériel bien protégé dans un paquet de bon format. UN RELOJ MAGNIFICO.UN VENDEDOR TOTALMENTE RECOMENDABLE Y UN SERVICIO DE ENVIO PERFECTO. Alles is perfect verlopen, het was trouwens niet de eerste keer. Enige minpunt (mijn ervaring althans) is met "post nl". Veel betere bij DHL. Snel verzonden, goed verpakt. Prachtig Horloge! L'emballage laisse à désirer pour une montre de cette valeur mais malgré cela la montre est très bien. The packaging is not enough for this pricey buy the watch is well.